​Innovaccer Inc., a Silicon Valley-Headquartered Healthcare analytics company, announced that it will launch the revamped version of its artificially intelligent Care Management Suite with in-built Chronic Care Management at HIMSS 2017. The revamped Care Management suite will be a part of Innovaccer’s proprietary product - Datashop, the operating system that powers healthcare. 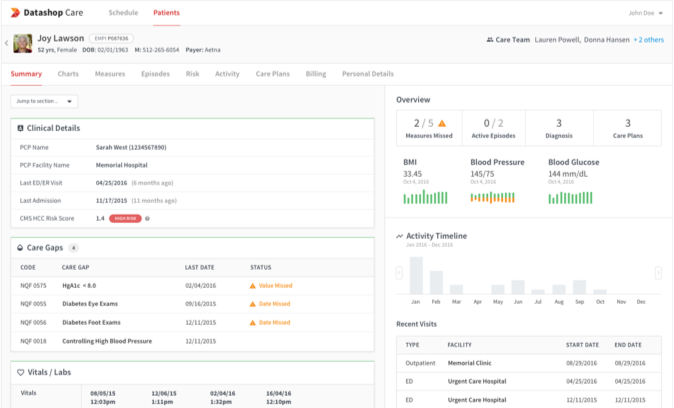 Datashop Care Management delivers an end-to-end solution that helps providers deliver comprehensive care, incorporating care coordination, chronic care management, and transitional care management into one platform. Datashop Care Management incorporates artificial intelligence to eliminate navigation through static reports and creates automated work queues and longitudinal holistic patient records obtained by integrating demographics, clinical, financial data, ADT, scheduling and other such relevant information. Based on the health information gathered through the real-time integration of data, Datashop Care Management smartly generates most suitable care plans for every patient. These summarized patient records can be viewed on visually engaging dashboards and can be shared across the members of care teams through this 2-way interoperable platform. Powered by intelligent machine learning systems, Datashop Care Management automates the care delivery process while also facilitating manual override to set the strategies and priorities as needed. The product also automatically identifies gaps-in-care and maps patients to health coaches within a network based on measures, performance, risk scores, and disease categories. The Chronic Care Management module provides a systematic assessment and care services for residents with chronic conditions. The module combines advanced analytics with a holistic Patient 360 view to providing caregivers with real-time, data-driven, decision support. Datashop Care Management maps the health coaches to patients, sends them push notifications about care plans and at-risk population and equips caregivers with real-time patient health status to enable better health outcomes. “Health Care is adapting itself to a value-based care era where it’s crucial that patients’ needs and preferences are understood. 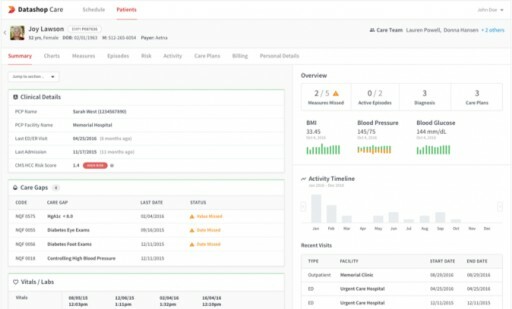 Datashop Care Management has been developed with the inputs from over a thousand healthcare professionals, and aims to deliver better care, reduce manual efforts, save health coaches’ time, and improve the effectiveness of the whole process,” says Abhinav Shashank, CEO, and Co-founder of Innovaccer. Datashop also offers advanced patient engagement to help patients understand the care procedures, ensure self-adherence to care plans, reminders about annual wellness visits or follow-up visits, and connect with the health coach or PCP. Innovaccer will introduce the Care Management suite at booth #6179-31 in Population Care Management Center at HIMSS 2017, the industry’s largest health IT education and exhibition hosted in the Orange County Convention Center in Orlando, Florida. To know more about Datashop Care, join Innovaccer at HIMSS or schedule a personal demo. Innovaccer Inc is a Silicon Valley-headquartered, Healthcare analytics company. Innovaccer’s aim is to simplify complex data from all points of care, streamline the information and help organizations make powerful decisions based on the key insights and predictions from their data. Its proprietary product Datashop enables provider organizations to use data as a source of innovation and has been deployed across 15 countries at academic institutions, governmental organizations, and several corporate enterprises such as Catholic Health Initiatives, Sonic Healthsystems, Stratifi, Catalyst, El Paso, MLK Community Hospital, Harvard, Stanford, MIT, and Wolters Kluwers.